This year the international youth basketball competition in Fougères has been reserved for the U17 age group. France will be joined by Belgium, Mali and Turkey in a tournament that brings together four nations that have qualified for the first ever FIBA World Championship Women U17. 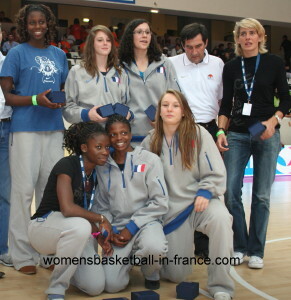 Arnauld Guppillotte the head coach for France started his selection process in March by looking at players outside the CFBB structure. He eliminated some of the players from the first training camp and added players from the CFBB structure and previous internationals to make up the official U17 training roster. The 16 players are: Justine Barthelemy, Romane Bernies, Sara Chevaugeon, Jodie Cornelie, Lola De Angelis, Christelle Diallo, Rudiane Eduardo, Olivia Epoupa, Margaux Galliou-Loko, Anaëlle Le Bruche, Marie Bernadette Mbuyamba-Tshimanga, Laure Mercia, Alice Nayo, Ester Niamke-Moisan, Caroline Plust and Claire Stievenard. The second training camp started on 24 May and ended on 9 June in Bourges. The Fougères tournament will give the coaching staff an opportunity to test the players in similar conditions to the World Championship with 3 matches in 3 days between 10 - 12 June 2010. France open up with a match against Mali on the first day. On the second day they play Turkey before closing on Saturday with the final game against Belgium.